We’ve received quite a bit of feedback in the months since GutenTag’s initial launch. One of the most frequent comments has been, “This is great, but downloading a tool and 4+ GB corpus is a huge barrier to entry.” Lots of people weren’t able to get a sense of what GutenTag does, either because they’re not comfortable downloading tools that run from the command line, or because their bandwidth limit couldn’t support such a massive download. 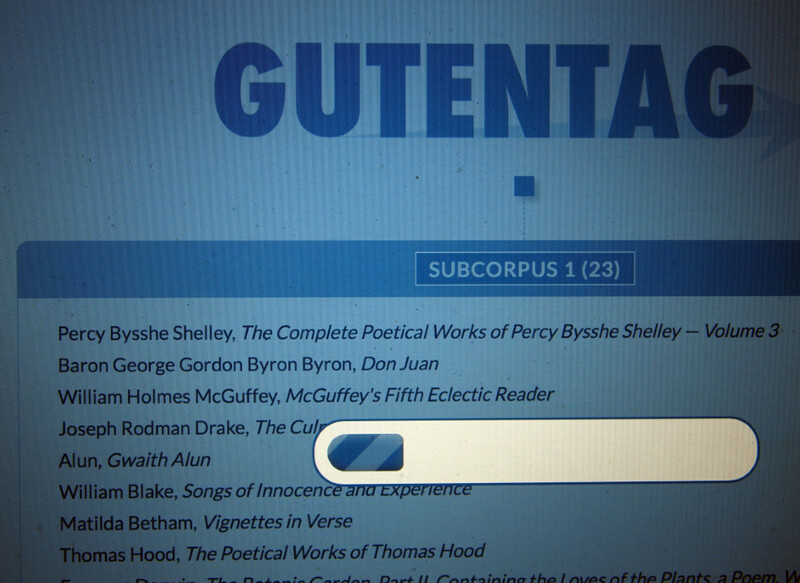 We’ve listened to this feedback and have made a web-based version of GutenTag. You are limited to the number of texts you can export from this version (1000). Anything bigger and you’re really better off with the downloadable version. The web-based tool produces downloadable .zip files. It currently works best in Chrome and Firefox — anything other than Safari, really. Check it out via the main GutenTag page or at gutentag.sdsu.edu. Huge thanks to Ron Nash and to the SDSU Library for all their help in getting this set up and hosting it.